I have a lot of friends in my school, but Dinda has been my best friend since junior high school. We don’t study in the same class, but we meet at school everyday during recess and after school. I first met her at junior high school orientation and we’ve been friends ever since. Dinda is good-looking. 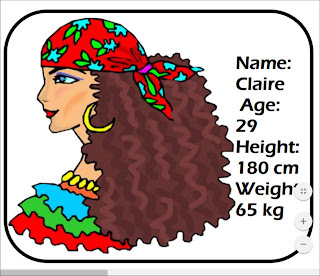 She’s not too tall, with fair skin and wavy black hair that she often puts in a ponytail. At school, she wears the uniform. Other than that, she likes to wear jeans, casual t-shirts and sneakers. Her favourite t-shirts are those in bright colors like pink, light green and orange. She is always cheerful. 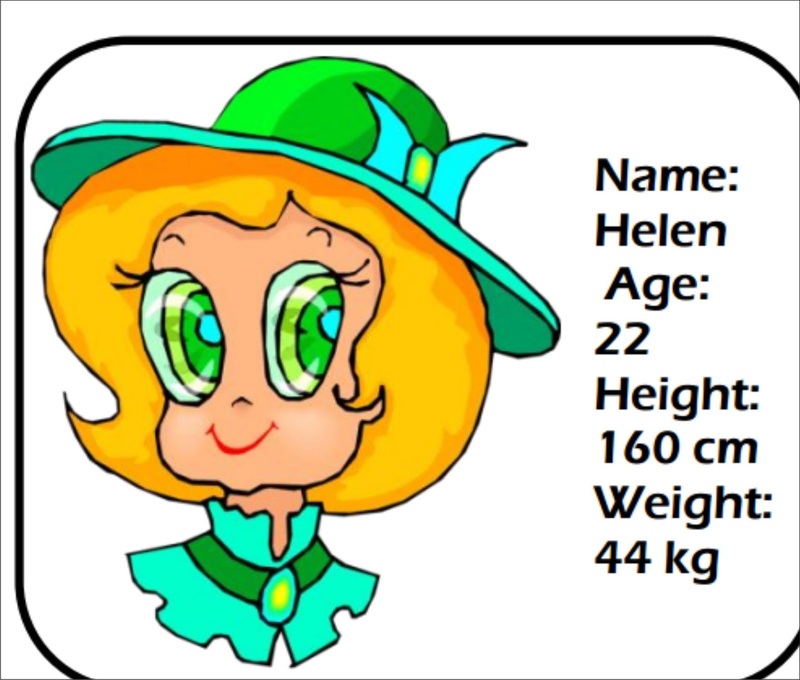 She is also very friendly and likes to make friends with anyone. Like many other girls, she is also talkative. She likes to share her thoughts and feelings to her friends. I think that’s why many friends enjoy her company. However, she can be a bit childish sometimes. For example, when she doesn’t get what she wants, she acts like a child and stamps her feet. Dinda adalah gadis yang cantik. Dia tidak tinggi, dengan kulit kuning langsat dan rambut hitam bergelombang yang sering kali dia buat poni. Di sekolah dia memakai seragam. Selain itu dia memakai Jens, kaos santai dan sepatu kat. Kaos kesukaanya adalah yang berwarna cerah seperti pink, hijau muda dan oranye. Dia sangat ceria. Dia juga sangat bersahabat dan berteman dengan banyak orang. Seperti gadis lainnya, dia juga suka ngomong. Dia suka membagi pikirannya dan perasaanya ke teman temannya. Saya piker bahwa itulah mengapa banyak teman suka bersamanya. Akan tetapi kadang kadang dia juga kekanak kanakan. Seperti contohnya ketika da tidak mendapatkan apa yang dia inginkan, dia berlagak seperti anak kecil dan mengetukkan kakinya. Dinda suka menggambar, khususnya kartun manga. Dia selalu membawa sketchbook kemanapun dia pergi. Dia akan menghabiskan banyak waktu untuk menggambar kararakter manga dari imaginasinya. Sketsanya sungguh luar biasa. Saya sungguh sangat bangga mempunyai teman seperti dia. 1. Who is being described in the text? 2. How long have the writer and Dinda been friends? 3. What does Dinda look like? 4. What are her favourite clothes? 5. What kind of t-shirts does she like? 6. Describe Dinda’s personality briefly. 7. Why do many friends enjoy Dinda’s company? 8. What is Dinda’s bad habit? 9. What is Dinda’s hobby? 10. How does the writer feel about Dinda? There are many ways to describe people, especially in physical appearance. 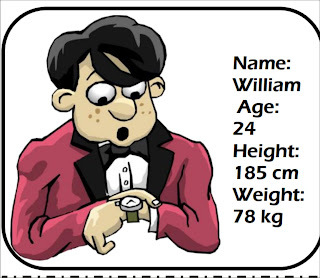 Physical appearance consists of general appearance, eyes, ears, face, nose, arms, hair, height and build. 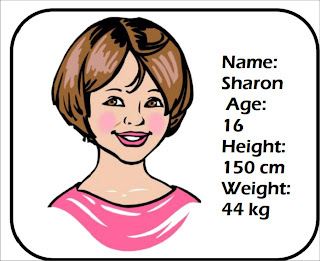 Sharon is a high school student. She is young. She is short and slim. She has got short, brown hair and brown eyes. William is handsome boy. He is young. He is tall and he is of medium weight. 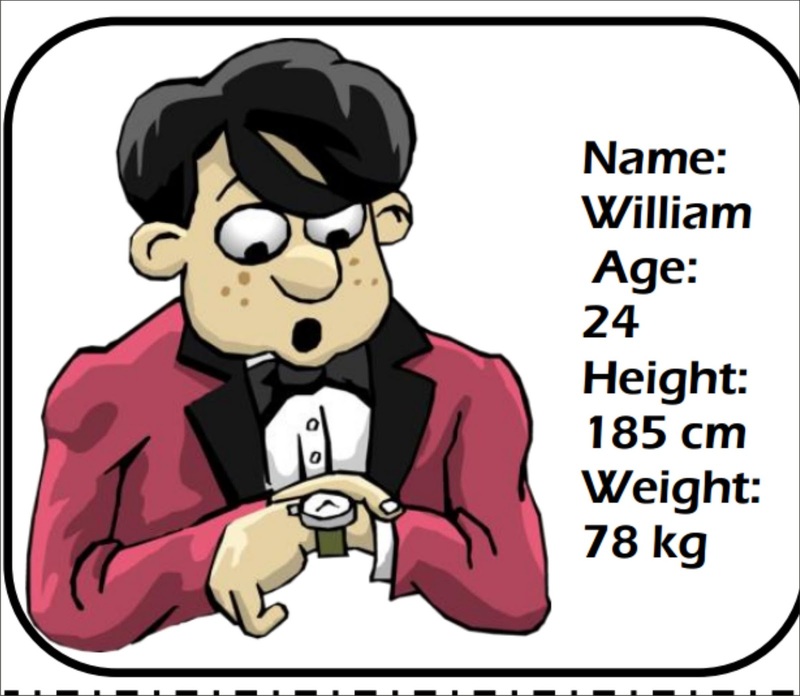 He has got short, black hair and black eyes. 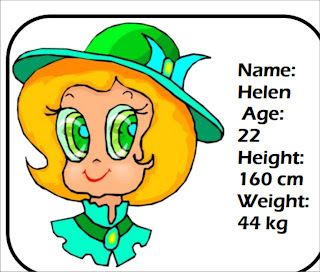 Helen is a young and beautiful girl. She is short and she is slim. She has got straight hair and green eyes. She is wearing a hat. 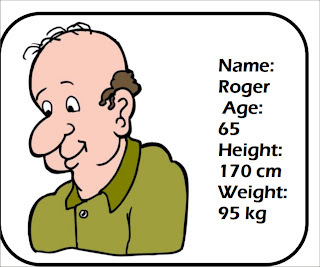 Roger is an old man. He doesn’t work. He is retired. He is of medium height and he is plump. He has got short, brown and black eyes. Claire is a fortune teller at a circus. She is young. She is tall and she is slim. She has got long, curly brown hair and blue eyes. 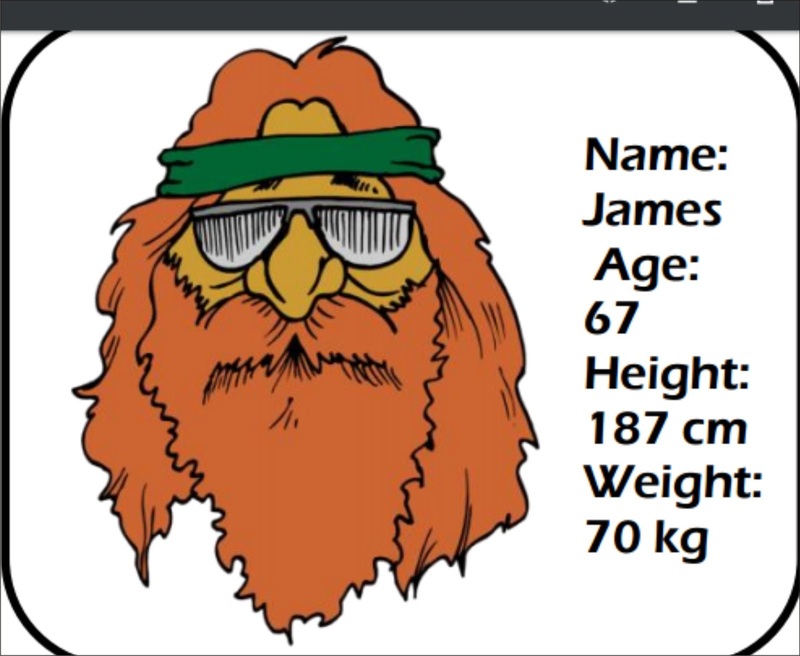 James is a musician in a rock group. He is tall and he is slim. He has got long, straight red hair. He is wearing glasses. He is old. 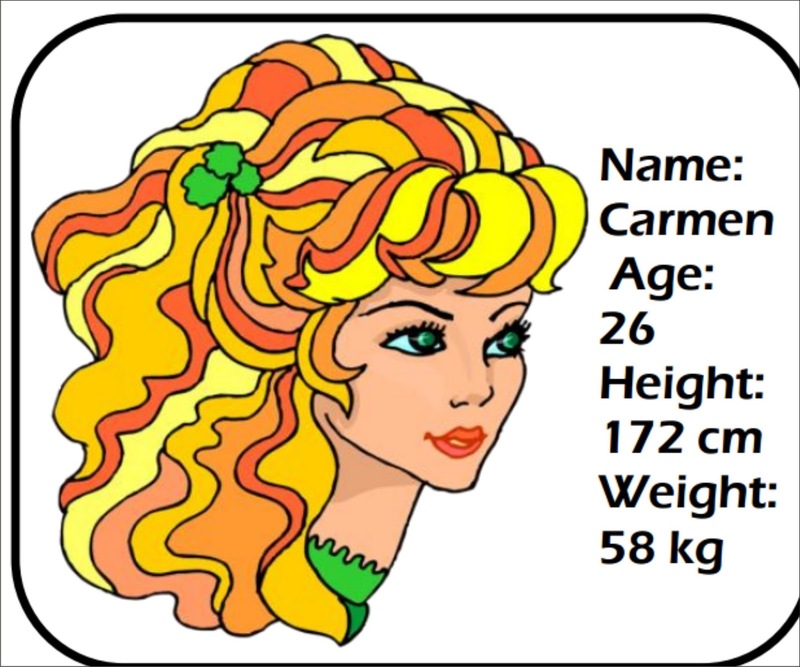 Carmen is a pretty woman. She is young. She is of medium height and she is slim. She has got long, wavy fair hair and green eyes. 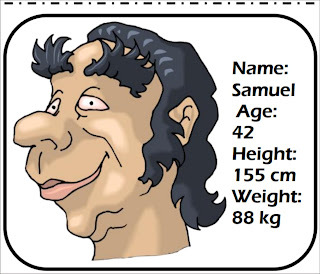 Samuel is a lorry driver. She is short and he is plump. 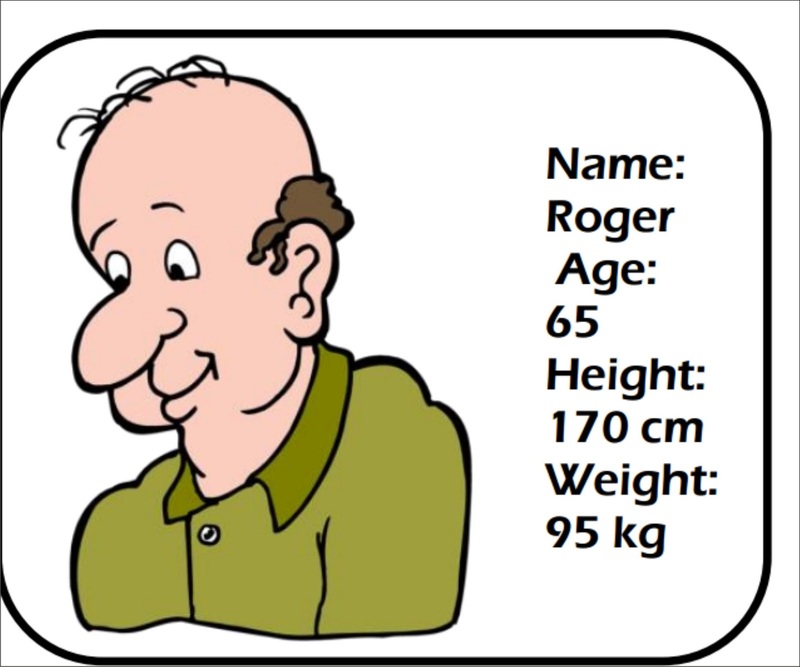 He has got short, wavy gray hair and big nose. He is middle aged man. 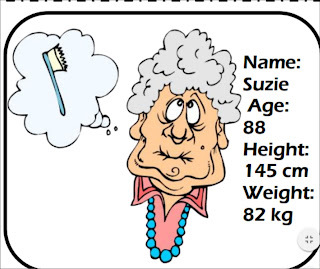 Suzie is an old woman. She is short and she is plump. 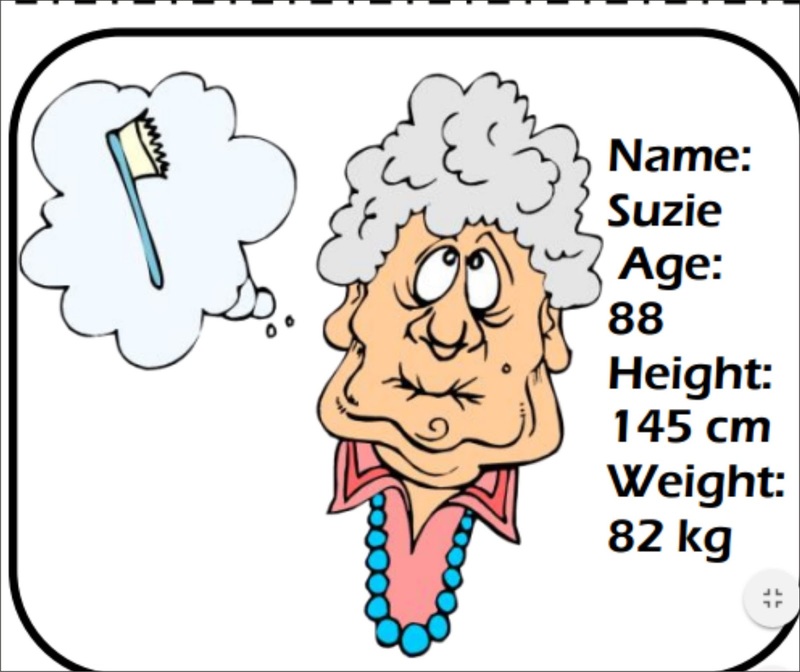 She has got short, curly, gray hair . she is wearing necklace. Belum ada tanggapan untuk "Describing people appearance ( Mendeskripsikan penampilanorang)"